Been very busy in the shop working on fences, gates and railings, but I did find some time to create a couple of garden sculptures. The first photo shows a 'Sassy Sun' hanging sculpture. This piece is made from cut steel and found objects. I like the attitude this artwork displays. The second photo is a larger version of the butterfly garden stake. 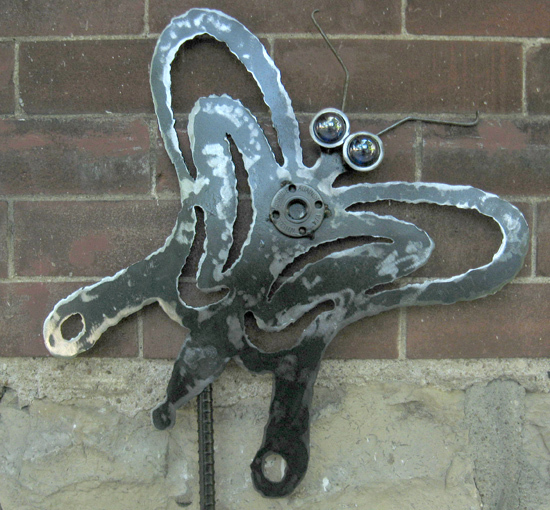 This is also from cut metal, adorned with blue glass eyes and other recycled materials. Enjoy!